The patient sees their personalised rehabilitation programme with tests and exercises accompanied by clear instructions and phased targets linked to their stage of recovery. The clinician can investigate patient results through multiple methods of data visualisation, graphical and tabular format, to assess how the patient is recovering. Clear depiction of recovery trends Clear graphical feedback of recovery and progress involves the patient in their rehabilitation contributing to heightened engagement and improved outcomes. By reviewing the comprehensive progress data, the clinician can prioritise resources to those who need them most. Prioritisation of resources If the clinician decides that a patient is progressing well, they can be saved the inconvenience of unnecessary hospital visits. With the help of the data provided by BPMpathway, the clinician can identify subtle deterioration in progress, which could be indicative of an emerging issue requiring intervention to prevent escalation and readmission. 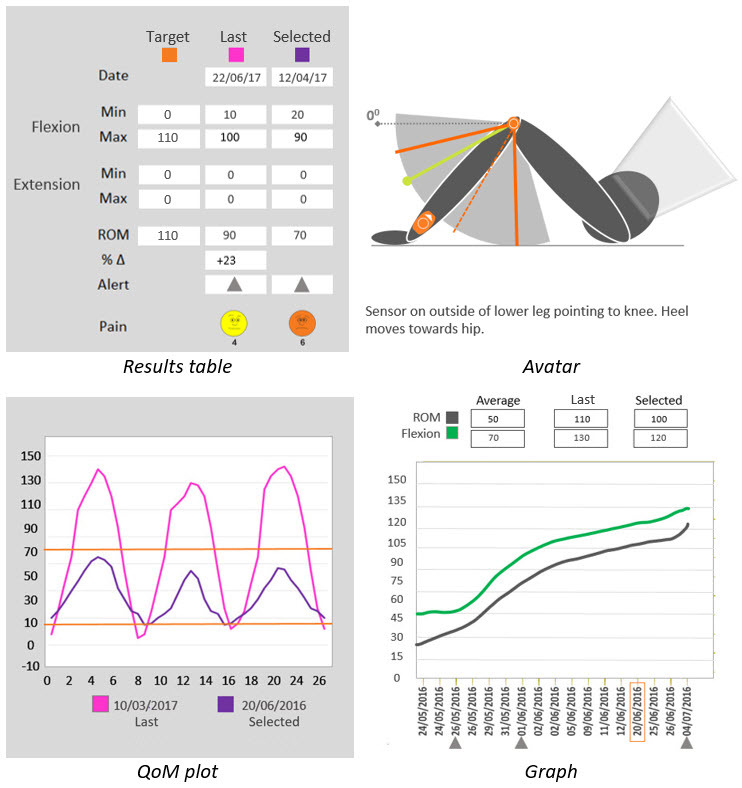 Early identification of potential issues Deterioration in ROM that the patient might dismiss as a blip can be spotted by the clinician using the test data streamed from their sensor and acted upon, thereby potentially sparing the patient the prospect of further hospitalisation and surgery. Alerts appear against patients who have failed to make progress or repeatedly missed tests, highlighting those potentially struggling with their recovery. The clinician can contact them to establish whether they need to be prioritised for support. Ongoing 2-way communication Two-way messaging in the software provides the patient with a reassuring communication link with their clinical team during the recovery period, which can be a time of uncertainty and anxiety. After doing their tests, the patient records a Wong Baker FACES® pain score, which provides the clinician with important PROMS reference data. Sharing of pain feedback During a test, the patient can mark pain points which are recorded against the test data sent to their clinician to inform where in their ROM pain is occurring. This ability is unique to BPMpathway and patented in the UK (GB 2551238) with international patents pending. Before a patient leaves hospital or during the pre-operative period, the clinician uses BPMpathway to create a personalised post-operative support programme to meet the patient’s individual needs, which they can undertake in the comfort of their own home. The Patient UI has been designed with ease of use in mind to encourage patient engagement by clearly explaining what is expected at each stage of their recovery. All the patient sees are the tests and exercises accompanied by instruction videos that they have to do as they are gently progressed through their programme with ever-increasing phased test targets as they achieve their goals. After they complete their daily routine, they are presented with a clear depiction of their progress and recovery trends and receive a message of encouragement associated with the phase achieved. A two-way messaging system means that patients can stay in touch with their medical team throughout the recovery period. This constitutes a reassuring communication link for patients who find themselves in an unfamiliar situation, unsure about what to expect. Should they have any questions or concerns, they can simply send a message from the software, just like an SMS. Patients, and their families alike, are encouraged to know that they are making progress and reassured by the fact that they can communicate directly with their clinician. Patient motivation has frequently been cited as being of key importance to the post-surgical rehabilitation process. BPMpathway has been developed to empower patients to take an actively role in their rehabilitation and has been specifically designed around the patient experience to make it quick and easy to use, wherever and whenever they want. An NHS study9 showed that patients using the technology exhibited heightened engagement with their rehabilitation, often continuing beyond the normal 12-week period, and were keen to engage with the intuitive, easy to understand technology and fascinated by the clear visualisation of their recovery. This increased engagement encourages patients to complete their rehabilitation programme, another key factor in reducing readmission rates, improved health outcomes and can contribute to an improvement in PROMS scores. A patient programme is a combination of tests to assess range of motion and physiotherapy exercises to help with rehabilitation. The purpose of a personalised programme is to set the patient realistic tests, targets and exercises linked to their stage of recovery that gently guides them through their recovery. Suitable ROM tests are selected by the clinician depending on the degree of joint mobility post intervention. For each test, the clinician can specify targets and appropriate exercises. All of the tests and exercises are accompanied by demonstration videos. Phasing – For each test, the clinician specifies a comfortable starting position, a start target ROM, an end target ROM and a number of phases. The targets the patient sees are gradually, systematically increased upon successful completion of phases. For each phase, a message of encouragement can be included. Once the patient completes all the phases in a test, they are automatically progressed onto their next test and accompanying exercises, if they have one assigned. To save time, BPMpathway enables the clinician to set up Default Programmes – prepopulated tests, limits and exercises by joint. 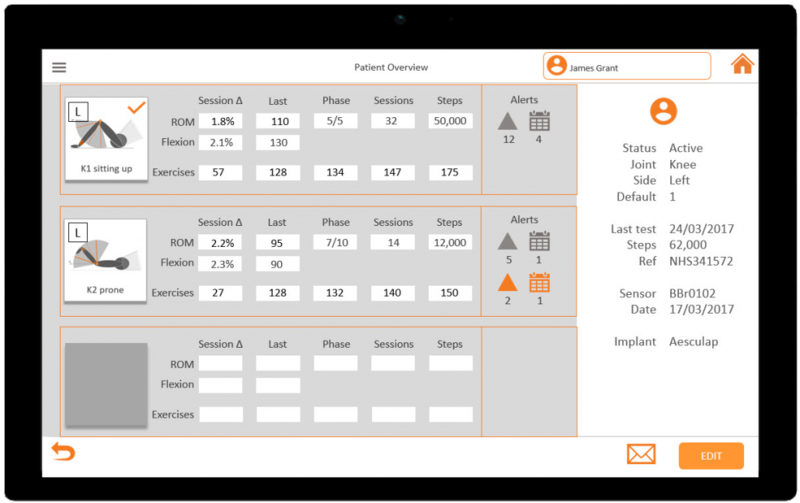 This eliminates the need to create tailored programmes for each individual patient and makes patient set-up swift and simple. To ensure that a programme still meets the patient’s specific needs, however, they can be assigned a Default Programme, which can then be modified as required. The patient’s software is linked to the their sensor via a unique system identifier that means it automatically downloads the updated settings. Where a patient programme does need adjusting, this is done via the professional software and transmitted over the air to the patient. https://www.bpmpathway.com/bbc-news-reports-on-bpmpathway/Via the Professional UI, the clinician has an overview of their patients and individual programmes. The professional software is designed not only to provide the clinician with a means of designing a personalised rehabilitation programme for their patient, but also to assess the patient’s on-going recovery progress against it, adjusting their rehabilitation routine if appropriate. Alerts appear against patients who have failed to progress through their programme or have repeatedly missed tests, thereby highlighting those potentially struggling with their recovery. The clinician can then investigate and establish whether they need to be prioritised for outpatient support. Prioritisation of post-operative resources – The approach adopted by many hospitals is to provide all orthopaedic patients with the same post-operative support package, but like any other area of healthcare, the resources to support this care pathway are under intense pressure and need to be prioritised. Should the clinician decide that a patient is progressing well at home based on the data gathered by BPMpathway, they may elect to spare them an unnecessary trip to hospital, thereby freeing up resources that would otherwise have been allocated to them to other patients who need them more. Identification of potential issues – The first outpatient appointment to check on progress post-discharge is typically 4-6 weeks following surgery. During this initial phase of their recovery, potential complications may go unnoticed by the patient, resulting in the risk of further hospitalisation and surgery. 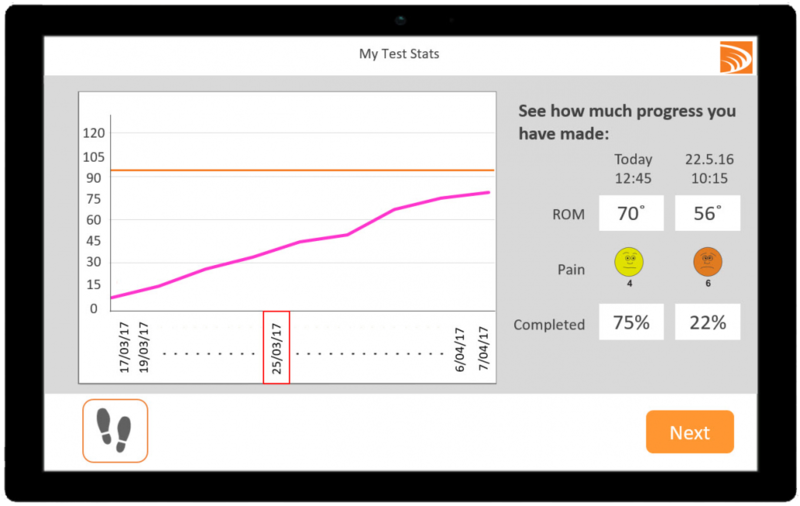 The clinician reviews the progress data through multiple methods of data visualisation, graphical and tabular, to assess how the patient is recovering. Supported by BPMpathway, the clinician can identify subtle deterioration in the comprehensive progress data, which the patient might otherwise dismiss as a blip, but may be indicative of a developing issue that requires intervention. Similarly, an escalation in reported pain would alert the clinician to an area for concern. Swiftly identifying and dealing with such matters can avoid escalation to the point of further surgical intervention, with all the costs and distress to the patient that it entails.